The horror genre is constantly finding new IPs and installments to classic franchises yearly. It’s clear that there is a massive market for gamers who wish to feel the horrifying dread and terror when battling or escaping monstrous creatures that lurk these game worlds. If you’re a fan of the horror genre and are looking for some recommendations when it comes to the Xbox One then we suggest checking out some of our favorites down below. With such a massive market already and one that will be growing for years to come, we’ll be updating this list with new thrilling installments. Did we miss out on a video game title? Let us know what your favorite horror video game is on the Xbox One by leaving a comment down below. Without further ado, here are our picks for the best horror video game titles on the Xbox One platform. We Happy Few is an indie survival horror video game that comes from developers Compulsion Games, previously known for their release of Contrast. Overall, within the game, players are set in an alternative timeline in Europe where citizens are forced to consume a daily drug, hindering them away from the realities of the world. Normally video game adaptations of movies are a bit sub-par, but there’s an exception for Friday the 13th: The Game. This is a video game title that heavily focuses on multiplayer gameplay. Friday the 13th: The Game can support up to eight players, seven of which are camp counselors while the remaining one will take on the role of Jason Voorhees. There are two end goals of the game, the players will work together in order to defeat Jason while the main enemy player will search and slaughter the hidden camp counselors. Among the Sleep is a first-person survival horror title by development team Krillbite Studio. The video game is slightly different than the norm as players take on the role of a young toddler. Within the game, players are in celebration of our toddler’s second birthday only for things to go uneasy. Quickly into the game, players are in for a terror as they explore an unusual world with a monstrous figure. Because players are a toddler, the character is limited to just exploring and avoiding obstacles. There’s even a challenge when it comes to running as players will find themselves falling over after running for too long of a period. The Resident Evil franchise is an iconic one that’s been around for decades. If you recalled the earlier years of the franchise roots then you may recall Resident Evil Zero. This title originally launched in 2002 for the Nintendo GameCube featuring protagonists Rebecca Chambers and Billy Coen. Capcom was looking to provide a tougher game for Resident Evil fans and as such they dropped the storage format used in the past installments. This meant that any item or weapon you may need could potentially be left on the ground in order to be picked up and used later. Likewise, the developers introduced a system in which players could switch between protagonists which oftentimes played a key element when it came to solving puzzles. If you’re looking for a side story to play through from the Resident Evil franchise then we have to suggest checking into the Resident Evil: Revelations titles. There’s a total of two installments available which will take place between the events of Resident Evil 4 and Resident Evil 5. Within Resident Evil: Revelations, players follow staple characters to the series, Jill Valentine and Chris Redfield as they attempt to stop a bioterrorist organization from infecting Earth’s oceans with a chemical virus. Resident Evil: Revelations 2 follow s the events of the first Revelations title which will see the return of Claire Redfield and for the first time ever, gamers can play as Barry Burton. It’s also worth noting that for the sequel, you’ll find that the narrative will take place between Resident Evil 5 and Resident Evil 6. There’s a strong emphasis on making the Revelations titles a survival horror experience. As such, players can expect to conserve ammo, solve puzzles, explore, and at times, evade the enemy. The Evil Within was directed by Resident Evil series creator, Shinji Mikami as the game focuses on Sebastian Castellanos a detective that gets pulled into a distorted world during an investigation. Staying true to the survival horror genre, The Evil Within will have players struggling against a fight with nightmarish creatures while avoiding traps, sneaking around the world and solving complex puzzles. 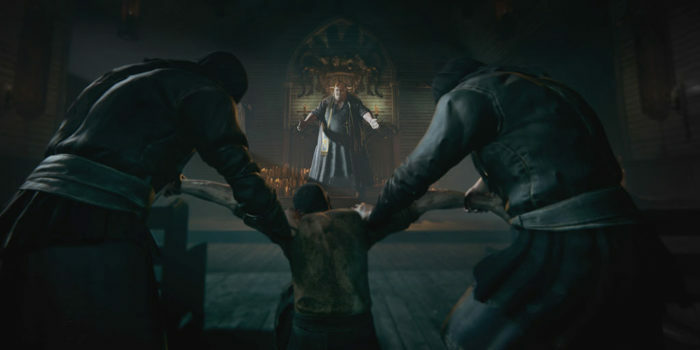 Outlast 2 follows similar game mechanics from the first installment while players this time around will take on the role of Blake Langermann, an investigative journalist and cameraman. In their journey, Blake and his wife become separated after their helicopter crashes. Much like the last installment, gamers are not suited with the ability to combat the enemies that lurk about. Instead, our protagonist will mostly have to hide and run away from any nearby danger while using his night vision camera to get a clear view of the area. Layers of Fear is a psychological horror video game by developers Bloober Team. The video game follows a painter who is attempting to finish his masterpiece though as you roam the mansion, disturbing secret information begins to bleed out. This is more of an exploration and puzzle-solving video game with a variety of jump scares littered throughout. It’s well worth noting that if players enjoy the game, there is a DLC campaign available known as Inheritance which follows the painter’s daughter who returns home. Alien: Isolation is set fifteen years after the events of the film Alien, where players will take on the role of Amanda Ripley, the daughter of Ellen Ripley who is on an investigation of tracking down the mysterious disappearance of her mother. Much like the old school survival horror titles, Alien: Isolation has an emphasis on players avoiding the hostile alien enemy. Instead, gamers must rely on some stealth mechanics to maneuver around the game. Currently, there is no word on if we will see a sequel released for Alien: Isolation, but the publishers behind the title, Sega, is considering tossing a sequel into the mix. However, what Miles finds is not only disturbing but dangerous leaving him to fight for his life. Being more of a survival horror title, players are encouraged to use stealth to their advantage while maneuvering over various obstacles. Likewise, a big portion of the game is based on the use of a night vision camera to see what is around the area. However, batteries are required to run the camera forcing players to seek out replacement batteries as they progress through the narrative campaign. Frictional Games are fantastic developers who know how to create terrifying video games as they previously released Penumbra and Amnesia. Their latest release falls right in line with the past two IP launches. Soma is a survival horror title that puts players into an underwater remote research facility. Within the game, players take on the role of Simon Jarrett who must uncover the truth behind the facility that’s gone rogue with machines taking on more human characteristics. If you’re familiar Amnesia, Soma takes on the similar gameplay style in that players will be keen to take a stealthy approach when dealing with the enemy. It’s best to avoid danger when possible while searching for clues and solving puzzles. It did not come as a shock when Bethesda Softworks announced that a new installment in The Evil Within franchise would be coming to market. The title takes place three years after the events of the first video game, where Sebastian once again, takes on a new investigation filled with horrifying creatures to face against. However, this investigation touches close to home for Sebastian as he will get the chance to tie up loose ends to his past. If you enjoyed the first installment then you will find that the same overall gameplay mechanics are attached. However, you will find that there are some changes to the title such as new voice actors and overall the narrative may not be the most deep story we’ve ever came across but it should still keep you interest while playing. If you have yet to play Resident Evil then you’re missing out on not only a classic title but one that spawned an entire franchise. Players take on the role of a special force unit that are sent into investigate the disappearance of another unit. This eventually leads them into an abandoned mansion where we discovered a virus has turned the local civilians into mindless zombies. Being an old survival horror title, there is a bigger emphasis on gathering resources and solving puzzles. In Little Nightmares, players will be taking on the role of a young girl named Six who had been kidnapped from her home and forced to work at a place known as The Maw, an underwater resort. The resort caters to the powerful elite, forcing Six to serve their needs. One day, Six is presented with a way back to freedom, though during her journey out of the unpredictable world of The Maw, Six catches the glimpse of the corruption of modern happiness though the journey to freedom is long and treacherous. Visually the game does offer an unsettling environment while the game overall is a platformer. For the most part, gamers will have to carefully maneuver around the levels while staying out of sight from the hostilities. You may recall the Prey franchise from when it first launched back in 2006 and it’s worth mentioning that this is not a reboot or remaster. Instead, the developers identify Prey as a reimagining of the IP with a new narrative. Much of the gameplay will involve exploring the station and solving a few puzzles as you progress. Okay while this may not be looked upon as the standout title when it comes to the horror genre, the narrative journey Telltale Games takes players in The Walking Dead is rather grim. The video game is part of a series of titles that are somewhat linked together. Of course the series is connected to The Walking Dead television and comic book adaptations as well, though prior knowledge about The Walking Dead content is not required before jumping into the dark journey. Overall, players step into the role of Lee Everett who ends up becoming a fatherly figure to a small girl named Clementine when the world ending zombie apocalypse suddenly breaks out. There is a series of episodes to play through in this point-and-click style adventure filled with morale ambiguity choices and puzzles. Likewise, there are a number of installments available which continues the narrative overall with the final title, The Walking Dead: The Final Season, wrapping up in 2019. Released in 2017, developers Bloober Team crafted a psychological horror title based around a detective. Within the game, players take on the role of Daniel Lazarski who is a detective named Daniel that is able to hack into peoples minds and investigate surroundings memorized by the person. Dead Space takes place in the distant future where players control Isaac Clarke, an engineer that works specifically on spacecrafts. When a ship sends out a distress signal, Isaac Clarke, and a team head out in hopes to fix the ship while bringing the crew back up and running their mining operations. However, various difficulties and mishaps cause Isaac with his crew to be left with a very slim chance of survival. Players are up against a slew of Necromorphs, vile creatures that reanimate dead corpses. To make gameplay a bit more tense and horrifying, developers eliminate the heads-up display, rendering most of the vital signs and other necessary info within Isaac’s suit. While the Dead Space series released for the Xbox 360, the games still hold up today and are available through backwards compatibility on the Xbox One. If you haven’t played these titles then you’ll want to look into picking them up within the Xbox One marketplace. Resident Evil 7 takes place four years after the events of Resident Evil 6, in a fictional city of Dulvey, Louisiana. Players will be taking on the role of Ethan, a man who is searching for his missing wife where his investigation leads him to a derelict plantation mansion that houses the oddity Baker family. It seems that Ethan will have to escape from the cannibalistic Baker family while also searching for clues as to why his journey took him to the Baker family. The overall game does see some changes from the norm in the franchise such as putting players in a first-person perspective. Furthermore, the game takes a step back to the early years of Resident Evil with a focus on survival horror elements rather than action based horror. After players complete the main campaign of Resident Evil 7 they can move on and enjoy the narrative DLC which does help flesh out the story along with tying up some of the loose ends from the narrative ending. Resident Evil is a staple franchise when it comes to the horror genre, especially for survival horror. Over the years Resident Evil evolved and became less of a survival horror game. Instead the franchise turned into more of an action horror experience with players battling against a variety of massive enemies with an endless supply of ammo though developers Capcom opted to bring the franchise back to its roots with its latest new main installment, Resident Evil 7. This got a warm reception and it wasn’t very long that they delivered to requests made by several fans, a remake to Resident Evil 2 that was done in a similar matter to the original Resident Evil remake. In January of 2019, fans were finally able to get their hands on a remake of Resident Evil 2 that for the most part was the same experience that they originally had when the game came out in 1998. While Capcom didn’t alter the narrative experience, there were some slight adjustments to the title outside of a visual overhaul. For instance, the game dropped the fixed camera angles and tank controls and instead offered modern controls. This included an over-the-shoulder view with traditional third-person controls. Despite these changes, the game was still a horror hit where players once again stepped into the roles of both Leon Kennedy, a rookie cop, and a college student named Claire Redfield. Both end up in Raccoon City shortly after the launch of a virus known as the T-Virus. This has created a wasteland for the city which became ruled by the undead among other hostile creatures that became altered through biological weapons.